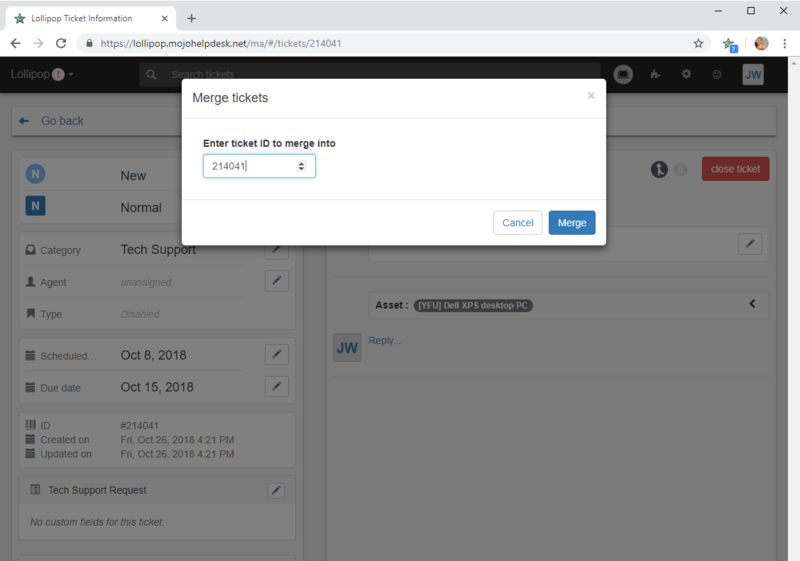 The ability to merge tickets is now available in Mojo Helpdesk. Ticket merge allows agents to group tickets together to cut down on redundancy and remedy ticket duplication. Let’s say you receive a ticket and the user accidentally submits a response to that ticket as a new ticket. 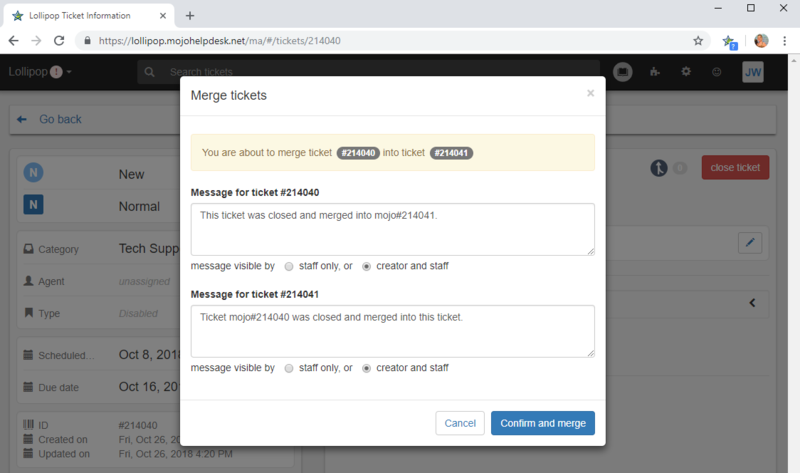 Now you can merge the ticket with the original and it will automatically close out the merged ticket. As the tickets merge, a comment can be added to the tickets to let the user and agent know what has happened. Or let’s say a user submits 5 tickets for the same issue (a little inpatient, perhaps) now an agent can select all the tickets and combine them into one ticket. Essentially, this closes the other tickets and adds a comment to the closed tickets. Check out the ability to merge tickets and let us know how it’s working for you. To learn more about merging tickets and how to manage merged tickets, please visit our knowledge base. Nice new feature. Thank you. This is nice, but from a user perspective just having the ticket number ready for the ticket your merging into is cumbersome. What would have been better is adding a quick search type tool that might pull up 5 or so open tickets with keywords you type in. And letting the user select those tickets. So it could be an either or situation. Enter the ticket num if you have it handy. Or search for an open ticket. Not willing to upgrade plans just to have the Merge icon that lets me see the commented and closed tickets. Maybe some other future feature will be compelling enough though. Merging doesn’t make as much sense as grouping with #hashtags or via search terms, email addresses, agents or even dates. To actually run a help desk for most companies, managers need to be able to develop case studies around issues in the field and the whole purpose of documenting all of these issues, resolutions and requests is to see what issues are widespread across the user base and which ones are isolated to individual clients or agents. Your merge tool is making this difficult by requiring an individual ID number which has to be located and copied and pasted to reference or link multiple tickets together and the implementation is impeding the natural workflow of most businesses and people. Use your product for a while internally, then make changes to your code base. You will want to create searches and select a check box to associate tickets with various human readable terms, not link items 1 by 1 via reference numbers. How does this affect response time calculations? This will be MOST helpful! Thanks much! Thank you! The ticket merge is a great feature. Just one question because errors do happen, if done by mistake, can the ticket merge be undone? Brother Printer is the pre-eminent brand in the low-cost printer market. Brother offering is lucrative and offers great value for the proposition to the customer. It hard for any OEM to bridge the gap between performance and price especially when it comes to the printer. Although Brother printer is quite handy in terms of price, they offer some performance bugs. Technical issues with the printer are not new to the digital world. Oftentimes printer deal with numerous glitches in term of functionality and performance. Dealing with these issues is the hair pulling task especially when you are out of basic technical skills. To ease out the thing, we recommend you to dial Brother Printer Number today and get an instant and precise solution on the printer issues. Cell phones With AI Camera: Smartphones these days, utilize Artificial Intelligence framework that is intended to learn and adjust your utilization design on an everyday premise. Artificial intelligence recognizes all the use design which you do on your telephones once in a while like changing to quiet when achieving the workplace, changing on to Bluetooth at home or shutting foundation applications at regular intervals and mechanize them for you after some time. Camera benefits are one of the key highlights; portable organizations are focusing on utilizing AI. The portable’s camera interface can distinguish the subject like the scene, nourishment, firecrackers and so forth. The user will get to know the following part which will be having it from the above part and it will help it more. The second area is always to give to the HP Spectre 13 is the runner-up choice and only a wonderful overall computer. It is among the first to support the seventh generation KB Lake chips but its far more than just a CPU upgrade, it’s thinner and lighter than it was before and is actually even more stylish and was already one of the best-looking computers available on the market. It’s just 13.8mm thin and it only weighs approximately 2.4 pounds, so it is a whole lot more comfortable use in tablet mode variation. To accommodate the new thinner shape HP changed the hinged mechanism and they have also reduced the computer keyboard travel but still just comfortable to use than previously. Another thing, particularly compared to the Lenovo Yoga 910, is the simple fact that this actually gets really great battery life of approximately 10-hours on an average charge. Can you please make it easier to know which ticket is being closed out and which ticket will be the master. Possibly include a snippet of the ticket title and not just the number. Wow. But this is cool. Very useful feature. When I took the tickets myself, I repeatedly encountered this problem. I am glad that now there is an opportunity to unite them. The function of combining the tickets is convenient to avoid the duplication. This type of agent is an effective user assistant. Everyone can also leave a comment.